Canadian brand EMM Labs is best known for its high-end SACD players and professional D/A converters, such as the EMM Labs XDS1 we have for review here. The company's owner, Ed Meitner, pioneered the use of DSD conversion, which was subsequently developed by Philips and Sony into a world standard. He famously identified a key mechanism for sound quality degradation in digital systems, which he describes as phase jitter, for which he developed test instrumentation and which he documented in a key paper for the Journal of the Audio engineering Society. He also holds a number of patents in this area. 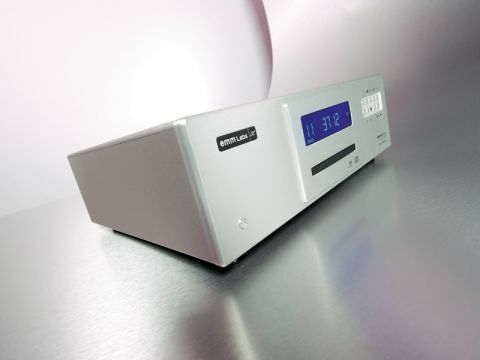 The first and only previous occasion we looked at an EMM Labs CD/SACD player, it was the one-box CDSA, clearly one of the finest available players of its kind. In fact, it was only bettered in the EMM Labs range by the two-box TSD1 SACD transport and the DAC2 D/A converter. Anecdotally, this new model, also a single-box player, is a better performer than even the DAC2/TSD1, making it the range flagship. The XDS1 is a two-channel only CD/SACD player which looks much like its predecessor, but there are important changes under the skin. The most prominent is a switch from the Philips-derived mechanism to one sourced from the esoteric division of Teac. The original player was controlled by a native state machine, which is, in effect, a lowest common denominator control system, rather than a dedicated control micro processor. This was done for sound quality reasons in accordance with Meitner's thinking that the best way to design a player is to 'simplify and minimise'. The state machine has been retained in the new player, which means that the control, system lacks certain niceties – there's only a rudimentary track time elapsed clock when playing, for example. The older player was also rather slow to read the disc TOC and to find tracks, but the functional superiority of the esoteric mechanism, combined with state machine code means that start-up and track search times for the XDS1 are comparable to other more conventional players. A great deal of attention has been paid to the analogue circuitry. for example, instead of the usual two or three stages of gain in the output section, the XDS1 has just one discrete class A gain stage from the DACC through to the output. The new power supply has three levels of active filtering for each polarity of each channel and each stage of the dual-differential audio path. The XDS1 also employs hand-matched capacitors in its audio path. Most digital players perform D/A conversion using a reconstruction filter with interpolation (oversampling) to smooth the analogue waveform, which works well in the analogue domain, but less so in the time domain where the tradeoff is pre and/or post ringing, depending on the filter design. In the case of the XDS1, the proprietary MDAT processing is said to preserve phase, frequency and dynamic integrity, with no pre or post ringing. Another proprietary technology replaces the usual phase lock loop with MFAST – Meitner Frequency Acquisition System Technology – which is said to lock onto any digital data. Rather than attenuating jitter, EMM Labs claim is that MFAST completely strips jitter from the datastream. Included in this player is a digital input which reclocks the incoming data locally to mitigate jitter imported from an external source. Digital inputs are available in Toslink and AES/EBU (balanced) form. Outputs are also available in single-ended and balanced flavours. Other socketry includes an external remote sensor input, a proprietary EMM optilink digital output, an RS-232 control connector and a USB for updates. A quality remote control is also included. The player is physically well presented. You can dim the large clear display or turn it off and the control system is more responsive than the CDSA. The player is solidly built and heavy too, with a thick, anti-resonance internal base and a massive power supply section. This said, the main control matrix is slightly muddled with controls that probably shouldn't be where they are. We found ourselves making silly errors, such as selecting absolute phase instead of play at times. Despite its obvious functionality, the players presentation is not as sophisticated as some other high-end players, from Marantz or Esoteric, for example. Make no mistake, the XDS1 was never intended to be the most polished player on the planet, but the engineering effort has gone into the bits that influence sound quality, and it does sound the part. Iin fact, it never put a foot wrong. This is by any standards a great CD player, one of the very best in our experience, but if you compare like with like, preferably (but not necessarily) using DSD recorded hybrid discs, SACD is simply better. It is smoother, sweeter and less mechanical, with superb instrumental separation and unusually explicit imagery. In fact, the XDS1 has an astonishingly clean, agile upper midband and treble, with no hint of the softness or the slight loss of focus you hear with many lesser players. It delivers musical weight and impact in a way that puts it in a very select class. There is no obvious artificiality at issue here, it is a supremely naturalistic sounding player in the live recording on the RCO label (haitink/concertgebouw) of Mahler's 4th Symphony and likewise the Telarc SACD sampler, as well as the wholly remarkable one from the crystal cables stable on the MAA label, which sounds nothing less than astonishingly life-like. But it is invidious to pick out individual recordings as the XDS1 is consistent in its abilities. It delivers every time. CD replay quality is worse, but it still outperforms most others. Redbook CD replay doesn't have the resolving power of SACD, but can still be remarkably good. An old favourite, a recording of the Haydn Piano Concertos with Leif Ove Andsnes and the Norwegian Chamber Orchestra (EMI), is a case in point. We were equally impressed by Scott Walker's remarkable Tilt album. Before investing in a player like this (we use the word invest advisedly) you need to be sure that SACD is for you. There is no longer an option to go DVD-Audio, which has essentially disappeared, but SACD is not exactly in the rudest of health. The nature of the format makes it difficult to record natively in DSD, which is not particularly friendly to engineers who may want to mix complex multiple microphone feeds and apply special effects as easily as with the PCM based Pro Tools, and who often end up recording on PCM, prior to upconversion to DSD at the production stage. SACD remains a force to be reckoned with: EMM labs and a tiny handful of others demonstrate that it still has the qualitative answers, but the format is at its best with simple recordings of acoustic material straight to DSD, where not much signal manipulation is required. This tends to favour classical, jazz and simply accompanied vocal material, which is not everyone's poison. With these provisions we observe that this is one of the finest sounding SACD players we've ever used, perhaps the finest. And although we weren't able to fully explore the ability of the digital input, on paper at least, it should be something very special.